An estimated 88% of brands today are using social media for marketing. If you’re not on Twitter, Facebook, Google+, or other major platforms, you risk getting left behind. However, the truth is, it’s getting much harder to stand out. How can your organization differentiate, and build relationships on noisy platforms? Provide social media managers with training on social media optimization. Ensure social media posts include the most important keywords. Create incentives for my audience to share, like, and comment on my content. While defining larger goals is certainly a start, it’s not enough. You’ve got to create implementable ways you’ll reach these objectives. To learn more about buyer personas, check out Building an Epic Buyer Persona: a Totally Comprehensive Guide. 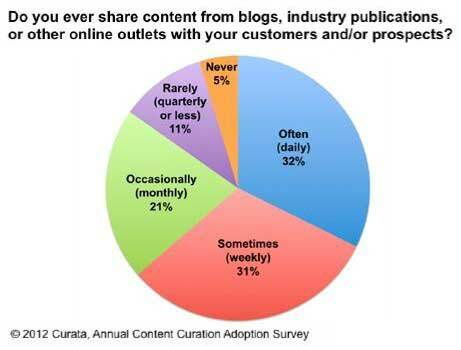 The majority of content marketers share curated content on a daily basis. It’s crucial to achieve the right balance of curated and create content on your social media channels. To make things easier for your social media team, define a list of approved, high-quality resources for content sharing. Optimally, these should be bloggers and brands with an audience that closely mirrors your own. Go beyond sharing to relationship building, so you can enjoy the benefits of having your gesture reciprocated. Your editorial calendar should be much more than a list of dates, blog title ideas, and keywords. It should be a document that manages the flow of information between your content and social teams, increasing transparency and collaboration. Create a document that’s clear enough that your social team can incorporate keywords, themes, and campaigns. For tips on picking the best tool for this task, I recommend The 15 Most Life-Changing Editorial Calendar Tools. While you shouldn’t skip any step on this list, this one is undoubtedly the most important. Your social media strategy is a living document, so you’ve got to revisit it on a regular basis, and determine ways to improve. Reviewing your metrics with a tool like Sprout Social can reveal hard truths about what is and isn’t working. Want to do even better? An agile approach is at the core of what we do at Writtent, which is why we’re constantly reevaluating, typically on a weekly basis. Love the insights here? For more ideas on how you can successfully promote your content marketing, check out Content Promotion Strategy: 23 Proven Ways to Explode Website Traffic.